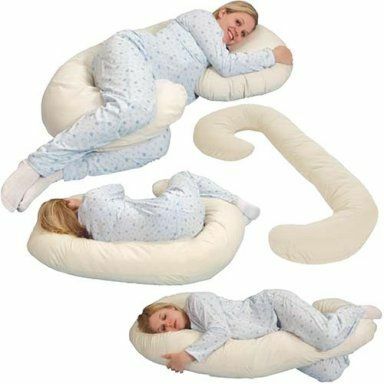 I'm sure you're all wondering what the heck a "snoogle pillow" is...or maybe you've already discovered it if you're an expectant Momma like myself. I just REALLY felt the need to dedicate an entire blog post to this little slice of heaven. I am heading into my 7th month of pregnancy, so sleeping is becoming a bit of a challenge. It's difficult to get comfortable, especially since I can't sleep flat on my back or stomach, as I normally would. My husband and I went to Baby's R Us this weekend to finish up our registry, and we came upon the "pillow" section. Knowing how much sleep has been a struggle for me, Chris was pretty insistent that we get the Snoogle (I think he's just fed up with hearing me complain in the middle of the night! Ha!) I thought it was silly to spend $60 on a pillow...but this might be one of my favorite/best purchases of 2015. The past few nights, I have slept like a champ only waking up once to reposition myself. Last night, I fell asleep and woke up in the same exact position...amazing. The pillow itself is pretty large and in charge...it really takes up some space in our queen bed (which now feels like a twin), but it's so worth it. You can purchase it on Amazon, Babys R Us, Bed Bath & Beyond...so many websites - so if you have any gift cards or discounts to those stores - check it out! Below are some photos of a rando lady (in killer pj's) thoroughly enjoying her Snoogle....and just think, THAT COULD BE YOU!